Quickly explore the energy landscape. Investigate an unlimited range of scenarios. Optimize to targets. Posterity Group Navigator™ Energy and Emissions Simulation Suite lets planners create flexible, realistic models to forecast how customer energy use and greenhouse gas (GHG) emissions respond to programs, technology, pricing and policy. Posterity Group Navigator™ Energy and Emissions Simulations Suite enables complex, multi-variable modelling not possible with traditional approaches. It lets planners quickly explore the energy landscape, investigate an unlimited range of scenarios, optimize to targets and resolve vexing strategic challenges. All backed by Posterity Group’s expert energy and emissions consulting services. Posterity Group Navigator™ models annual energy consumption and GHG emissions, by region, rate class, block type (such as building, factory or ship) and energy end use. Detailed data from census and other government sources, utility customer data, end use surveys and research reports are compiled by a powerful processing engine to produce a comprehensive dataset available for scenario analysis. Every calculated value is stored and can be filtered and rolled-up for maximum flexibility of analysis and presentation using standard office productivity software. 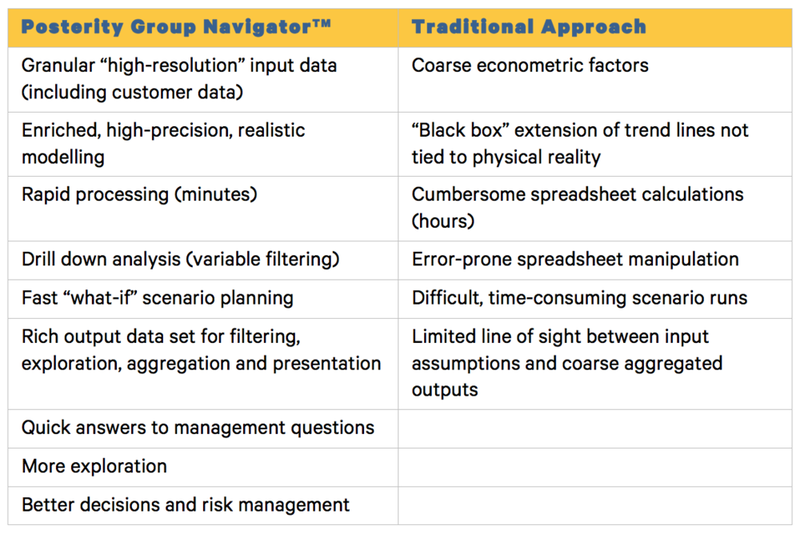 Unlike cumbersome, error-prone spreadsheets and “black box” econometric models, Posterity Group Navigator™ uses actual customer data to create a rich, realistic model that can be easily queried and modified. Calculations that once took hours can be executed in minutes. This encourages exploration of the impact of variables, running scenarios to test assumptions and solving for optimization targets within specific constraints. Because there’s always a clear line of sight between input data and the output dataset, planners have confidence in their results and can more effectively communicate the dynamics of their energy use model to stakeholders. 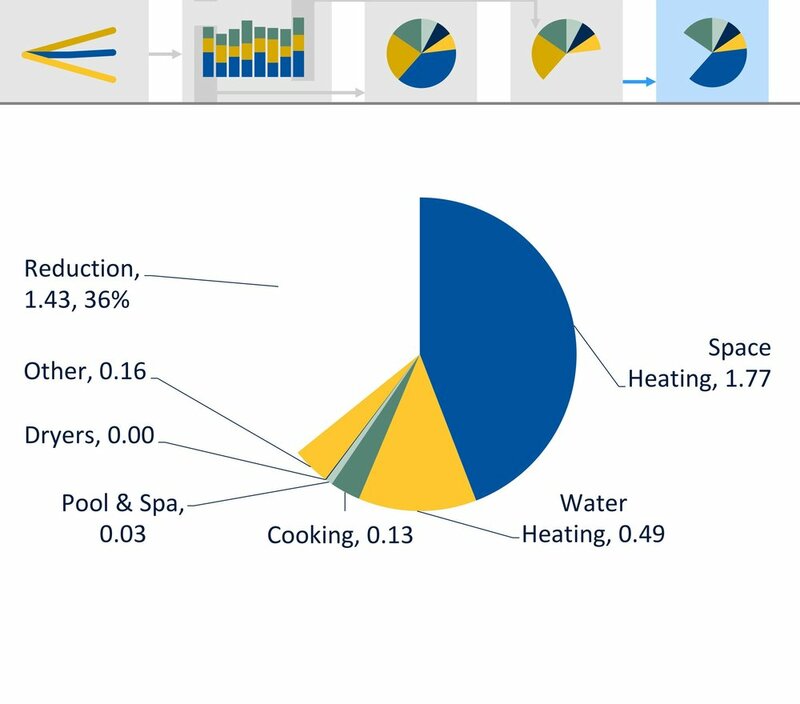 Detailed output data can be filtered across multiple dimensions and graphically presented to quickly answer questions and reveal deeper insights. With this flexibility and processing power, planners and analysts can spend more time thinking about opportunities rather than massaging data and manipulating spreadsheets. They can quickly answer stakeholder questions and easily explore a wider range of options. There is significant variation in the composition of end-use between building types. In apartments, space heating and hot water are significant end-uses. New dwellings emit 36% less CO2 than the 2018 average through more efficient technology but cooking emissions grow due to more gas ranges. Posterity Group Navigator™ is used by utility companies, government agencies, communities, industry associations, clean-tech companies, investors, and energy/carbon consultants to model and explore a wide range of energy use, efficiency, technology and GHG questions. Planners and decision-makers rely on its realistic forecasts and scenario simulations to inform capital plans, policy and program decisions and investments. Using Posterity Group Navigator™, utility resource, revenue and system planners can create an integrated model of service territories to estimate future load with greater precision and realism than can be done with typical econometric trending. It enables variation in load forecasts, impact of conservation programs and impact of policy changes to be considered within an integrated resource plan. A major North American natural gas utility used Posterity Group Navigator™ to develop a load forecasting model for its ongoing Integrated Resource Planning (IRP) process. “Data from a wide range of internal and external sources were assembled to run 3 core simulations and over 20 exploratory variations. The output data array was used to prepare tabular and graphical input for a Long Term Gas Resource Plan filed with the regulator and to respond during the Information Request (IR) process. Posterity Group Navigator™ has also been integrated into the utility’s Load Forecasting system and the output is being used to enhance its sophisticated system capacity planning." With Posterity Group Navigator™, government policy planners and utilities can model energy consumption over time by building-type and end use. By applying energy efficiency improvement assumptions, planners can estimate potential savings to guide standards development, set energy and GHG emissions policy, and design efficiency programs. Natural Resources Canada (NRCan) modelled national energy savings and GHG reduction. A small-scale study for a small Ontario First Nation community that integrated simple, community-level energy-use knowledge, electricity billing records and publicly available energy efficiency data to model future energy use and efficiency scenarios. A comprehensive GHG inventory and mitigation scenarios for heating applications on behalf of the Ontario Ministry of the Environment and Climate Change. Posterity Group offers a range of data collection, benchmarking and modelling services to ensure our clients get the most from Posterity Group Navigator™. Our experts can help you develop a custom model for a specific project or ongoing inter-departmental planning. We’ll ensure you get the most from existing industry and government data and take full advantage of your investment in customer data acquisition. To learn more contact us for a demonstration of Posterity Group Navigator™. Posterity Group provides tailored advisory services that help clients assess energy conservation and demand management opportunities, design programs and evaluate their performance for a low-carbon economy. Drawing on the latest best-practices we work collaboratively with clients so they can make timely informed investment decisions, navigate new market realities and achieve high-impact outcomes. Forward-thinking utility planners and government agencies rely on Posterity Group insights to respond to the rapidly changing energy and carbon landscape. Visit us at www.PosterityGroup.ca for more information. Contact us for a demonstration of Posterity Group Navigator™! Exceptional Energy and Climate Advisory Services – spanning planning, design, implementation, and evaluation.